Wednesday, President Obama imposed a salary cap of $500,000 on top executives at companies that want access to the Troubled Assets Relief Program (TARP) to shore up their ravaged balance sheets. Mr. Obama's move came in response to a series of painfully tin-eared actions on the parts of several major companies that had already received taxpayer funds from TARP, and which have caused significant public outcry. Insurance giant AIG, for instance, received $152 billion from the American public, but almost immediately afterward proceeded to spend nearly half a million dollars on a luxury employee retreat, and had to be shamed into canceling a second such junket. Citigroup, recipient of $45 billion in TARP funds, was roundly thrashed after it was learned that the company was continuing with plans to purchase a $50 million 12-seat corporate jet, from which it eventually backed away after attention to the matter from Washington. Bank of America, meanwhile - which also received $45 billion in taxpayer money - determined that $10 million of that would be well-spent on a carnival-like promotion called the NFL Experience at this year's Super Bowl. And in a move that has made him the poster child for Wall Street arrogance and disconnection, Merrill Lynch's former CEO, John Thain, paid $1.2 million to redecorate his office - including a trash can costing more than $1,400 - while his firm lost $15.3 billion in the fourth quarter of last year. At a time when most of these institutions were teetering on collapse, and they are asking taxpayers to help sustain them - that is the height of irresponsibility. It is shameful... You know, the American people understand that we've got a big hole that we've got to dig ourselves out of. But they don't like the idea that people are digging a bigger hole, even as they're being asked to fill it up. Part of what we're going to need is for the folks on Wall Street who are asking for help to show some restraint and show some discipline and show some sense of responsibility. Wall Street's response was every bit as staggeringly out of touch as their other behavior, justifying the disbursement of such huge sums in the name of "rewarding performance" and "retaining top employees." Following that logic, of course, financial industry performance ought to be somewhere around the sixth best it's ever been, and it should be easy for workers to find jobs at other firms. Since it would be difficult for that to be more obviously not the case, it's hard to know whether it is contempt or stupidity that has birthed this sense of entitlement. My money is on a mixture of both, and on Thursday, former Hewlett-Packard CEO (and John McCain campaign adviser) Carly Fiorina made every effort to prove me right in a commentary at CNN.com. 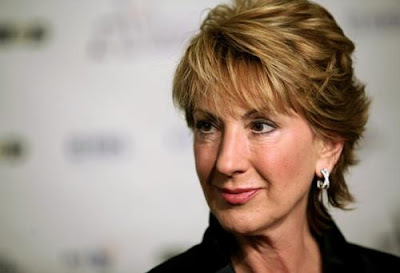 For those unfamiliar with Ms. Fiorina's work, under her leadership, HP laid off 20,000 workers and saw its share price drop by half, but she departed the company with a severance package worth $45 million, including a $21.4 million in cash. Clearly, she knows a little bit about unmerited compensation, and she doesn't disappoint in her opinion piece. In it, her priorities are manifest, as she attempts to make the case that "it doesn't strengthen our economy when government decides how much each job is worth. In America we leave that job to markets," while - with what I can only describe as a jaw-dropping lack of irony - completely ignoring the fact that the firms who have lost "major bets" and at which "mistakes were made" are being spared those same market forces through taxpayer largesse. Worse, she attempts to mask this fundamental hypocrisy by portraying Mr. Obama's new pay limits as some sort of broad assault on the American market that would be made permanent, rather than a short-term fix necessitated by greed and arrogance. Ms. Fiorina seems to imply that the president's policy could somehow affect enterprises operating independently of government support, and she even pretends that compensation caps aren't a routine condition of direct investment. (Just ask any entrepreneur looking for venture capital if his salary is unfettered by conditions from private equity investors.) While she proposes several other reforms (some of which would, in fact, be welcome), they would all be long-term solutions, and there is no disguising the central thrust of her argument: Executive compensation should never be restrained, even in cases where public money is involved. Since they are not retroactive, it remains to be seen whether President Obama's restrictions on executive pay will even affect a large number of companies. Nonetheless, from a public policy standpoint, these limits are clearly the right thing to do. Going forward, firms that want to avail themselves of TARP will need to determine whether they wish to endure boundaries on the compensation of their leadership, but there is nothing antagonistic to capitalism in this at all. Pay caps in exchange for public assistance become merely a condition of the marketplace, and if it is a sufficiently unattractive one, companies are entirely free to make a go of it on their own. At the same time, in the larger picture, I'm frankly at a loss to explain why anyone would argue that firms receiving tens - if not hundreds - of billions of dollars in public money shouldn't have to abide by some extraordinary rules. Certainly, under George W. Bush, favored companies like Halliburton received massive no-bid contracts - heck, $9 billion in cash simply went missing in Iraq - but the arrogance and wrong-headedness required to view that as "the way it should be" rather than a horrific and irresponsible aberration is indicative of a deep and abiding sickness among certain elements of our society. What most clearly brands Ms. Fiorina's perspective as a paen to lax oversight however, is that it completely fails to acknowledge the fact that what limited restrictions are placed on TARP funds - and what caps may exist on executive pay - are no more than the other end of the very bonus spectrum which she and others like her so loudly champion. They are incentives to change behavior, and they work. In fact, Goldman Sachs Chief Financial Officer David Viniar has already stated that he wants to be free of those restraints as soon as possible, and is therefore working to ensure that his company repays the TARP money it accepted as quickly as it can. I think most of us would agree that repayment of public money by troubled financial institutions is a good thing. Unless of course, you're someone like Carly Fiorina, whose own compensation was in no way linked to actual results, and who apparently thinks that the use of public money should come with no strings attached.